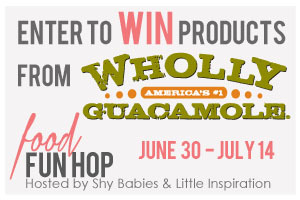 Welcome to my little corner of the Food Fun Hop event Hosted by Shy Babies & Little Inspiration!! I know my post is a bit early this week, but I am SO EXCITED! You see, this week, I recieved a cooler full of Wholly Guacamole products. The deal was to try them, make something with them and share it with you! Oh, and they’re giving away another cooler to one of my lucky readers! Check out the RaffleCopter after the recipe. So first things first. How did I like the products? Well, I’ve got to tell you. I’m a salsa fiend. I would take chips and salsa over any snack, any day. So the first thing that I did was open all of the salsas and give them a chip test. I saved the hottest for last because I’m kind of a wuss that way. They. Are. So. Good. No preservatives, and all natural baby. That’s the way to go. All of the salsas were de-lish (I think the mango might not be *quite* suited to chip dipping. Would be great on a fish taco) but my favorite was the roasted tomato. It has just enough heat- ad is packed with a deep tomato flavor that I found to be amazing with some fresh tortilla chips. Ugh. So good. Alright, alright, chip dipping isn’t the only thing you can do with guacamole or salsa. And, part of this Food Fun Hop invitation was to make a dish with the products. So, I dug in with just a spoon to each of the salsas and tried to see what came to mind. Of course I was just SO drawn to the Roasted Tomato flavor, that the recipe I thought of revolved around it. 3 roma tomatoes, roughly chopped. Prep and cut all of your ingredients. In a large bowl, add the pasta. 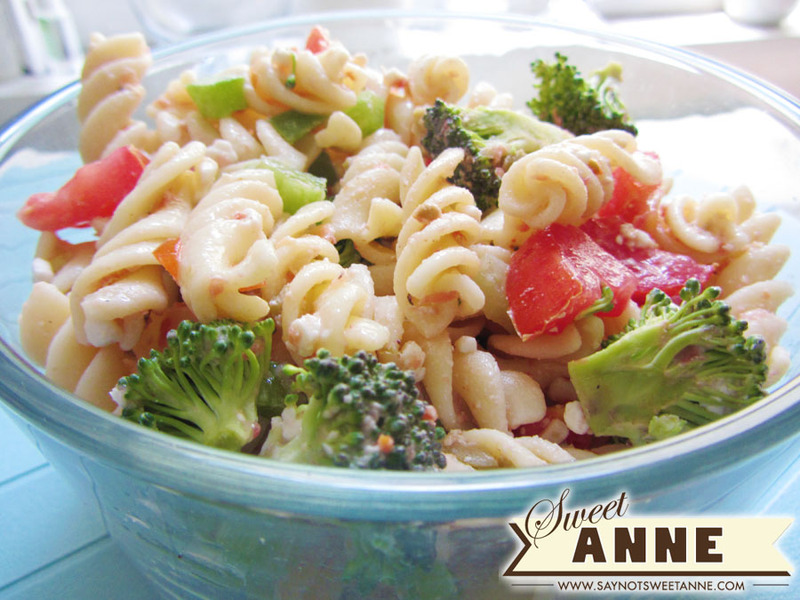 Combine veggies with pasta, stir to incorporate. Add salsa, dressing ,cottage cheese and olives. Stir well. That’s it! 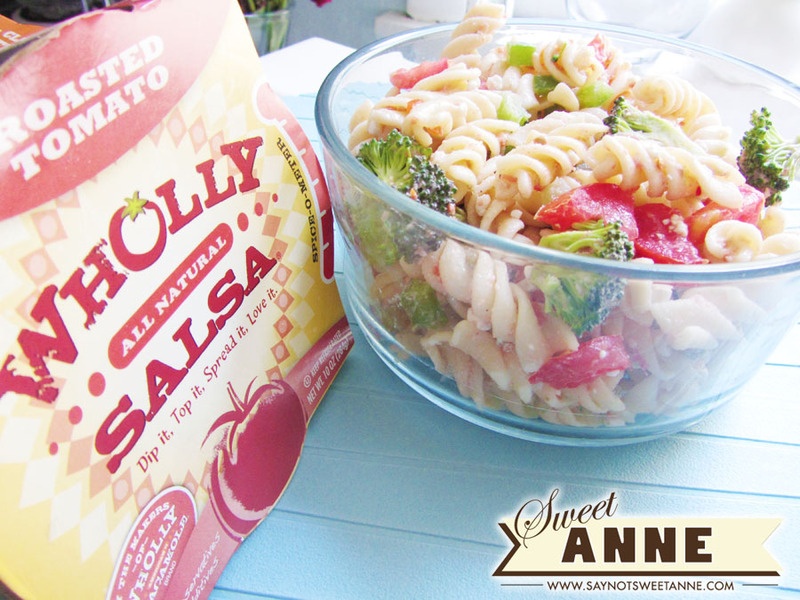 I know it sounds easy, and you might be thinking, “Salsa and cottage cheese in a pasta salad! ?” But trust me- its good. The Roasted Tomato salsa adds a great depth of flavor that goes really well with the fresh tomatoes. Plus its got a little spice. That adds a great kick to the dish, and plays nicely with the cooling creamy flavor of the cottage cheese. Altogether its a great side to any meal- if I do say so myself. SO! Wanna make some yourself? I know you do! Well, I can help you out. 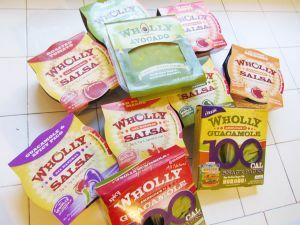 Enter the giveaway below and Wholly Guacamole will give one lucky reader a FREE COOLER full of products! Here’s a peek at what mine looked like! Yeah, That’s ALOT of salsa/Guacamole! And the flavors are awesome! You can experiment like I did, and find a new favorite! …and last but not least- the Party! That’s the Hop part of the Food Fun Hop! do’t forget to check the other participants out! I’m sure they made *amazing* things with their cooler full of Wholly Guacamole! Wholly Salsa Products were received in order to facilitate this review and giveaway, but all opinions are 100% my own. Soun ds like a great tasting and healthy dish! Thanks so much for sharing at Busy Monday!